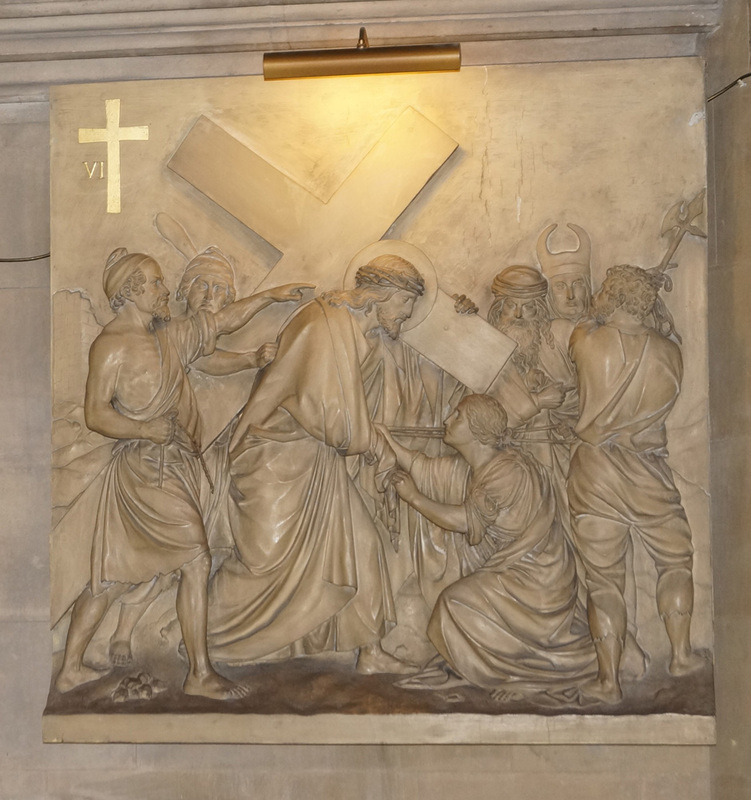 A set of Stations of the Cross by Johann Petz were painted over with lead white paint in the 1920s. 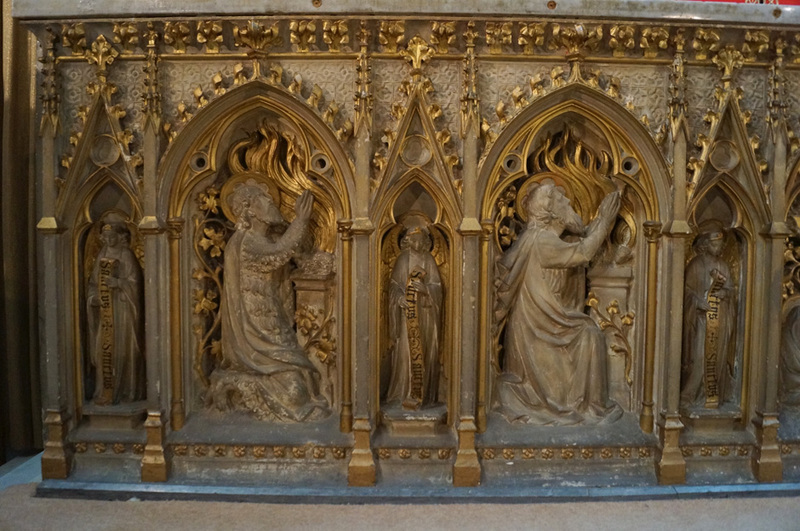 They were originally polychrome on carved wood but as fashions change so did the appreciation for Victorian art change at the beginning of the 20th century. 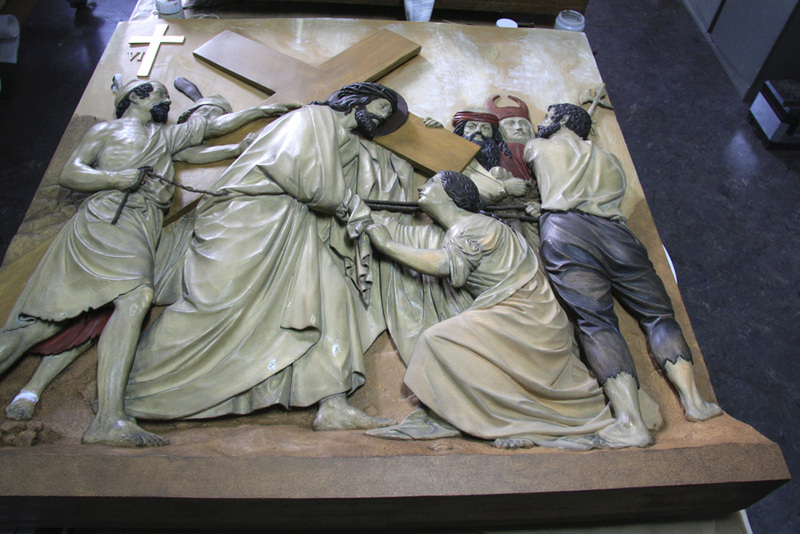 However, the trend toward recovering the authenticity of original artifacts and decorative interiors has driven the research and reinstatement of original paint finishes, as practicable as possible. 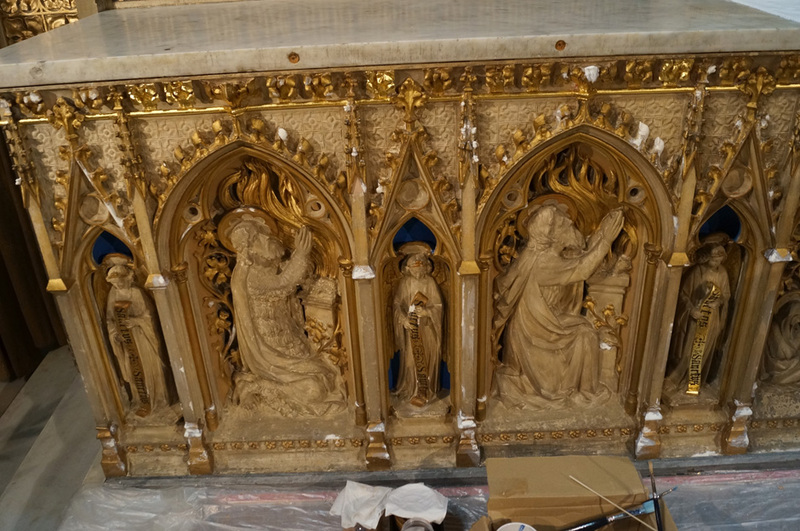 Lead white paint is notoriously difficult to remove because it forms an insoluble compound when in combination with oil paint. 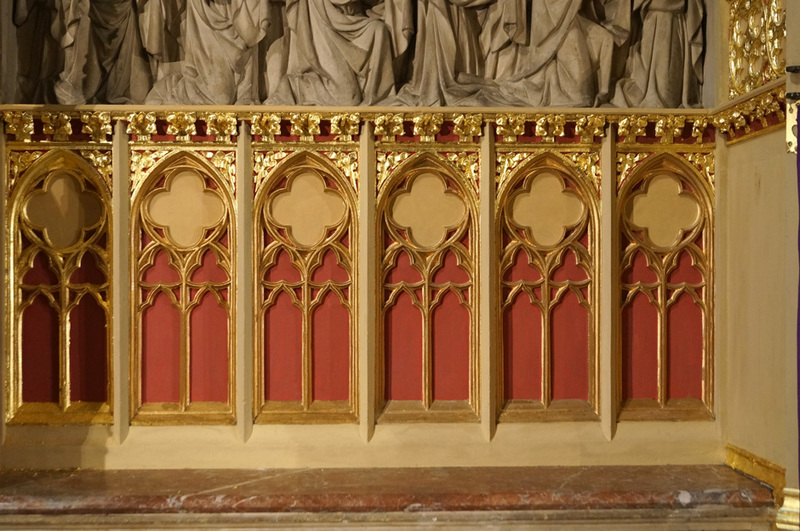 A fairly aggressive paint stripper would be necessary in order to fully dissolve it, but unfortunately, that would also mean removing the original polychromy. There was no safe way to separate the white paint successfully without damaging the original. 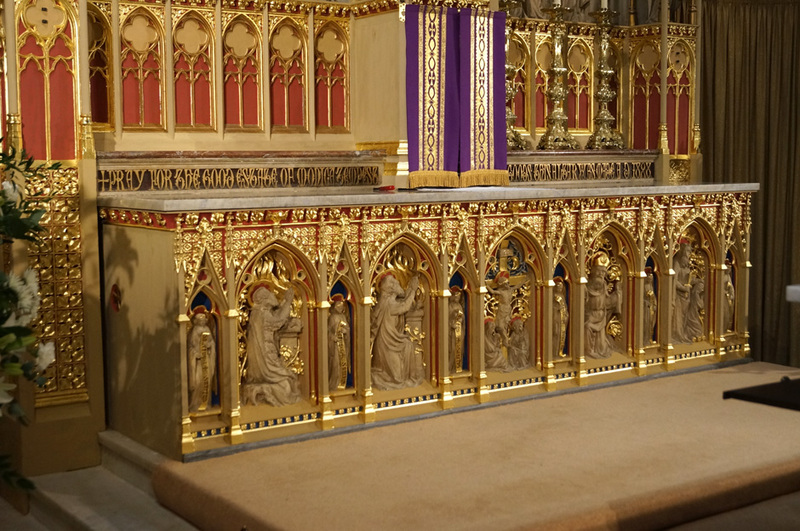 Therefore, an approach was taken to investigate the original colours and reinstate them over the lead white coating. The original polychromy of ‘Veronica Wipes the Face of Jesus’ was carefully investigated through localised scraping tests under magnification. The colours were recorded and then matched subsequently. 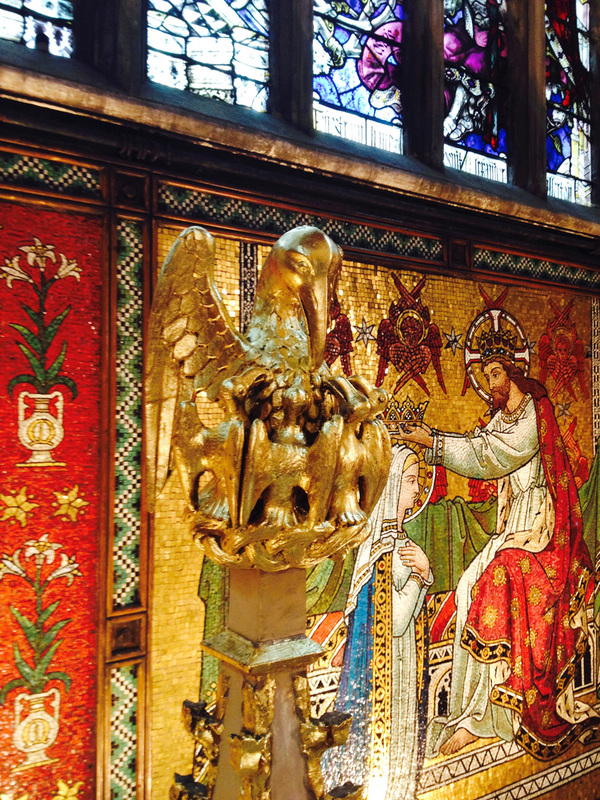 Gold leaf was found over the background, Christ’s halo and garment trims. The original colours were gradually built in layers, starting with flat base coats and progressing onto fine textural effects and details. 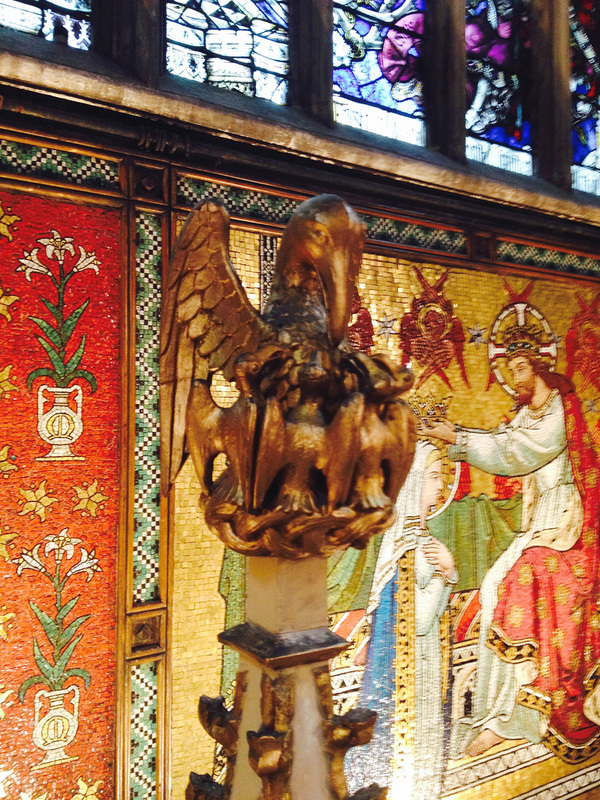 The gold leaf was re-instated at the end. 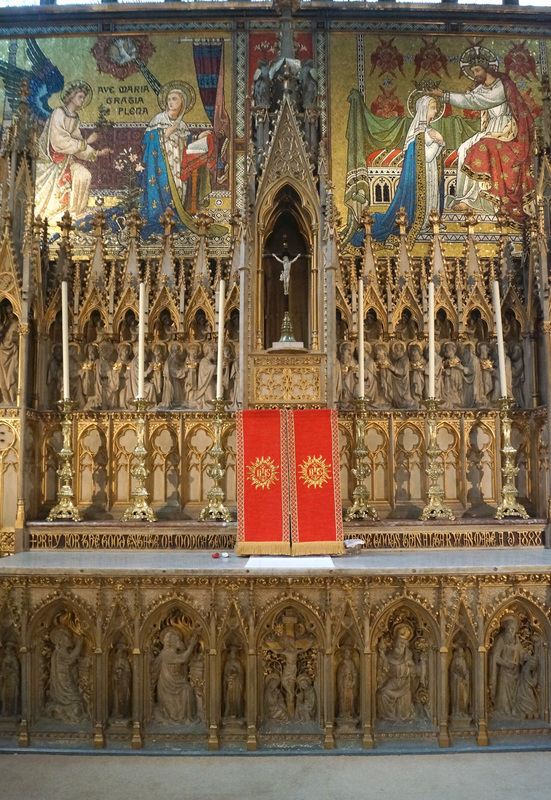 The main Pugin Altar is of Polychrome Caen stone. 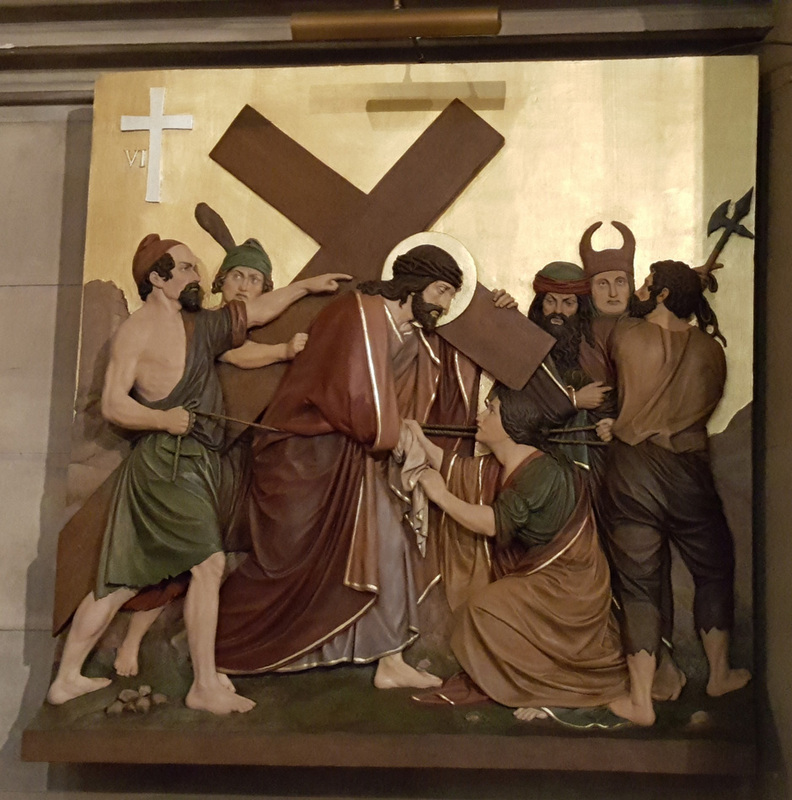 “The frontal depicts the Old Testament sacrifices of Abel, Noah, Melchisedek and Abraham, on either side of the Crucifixion. 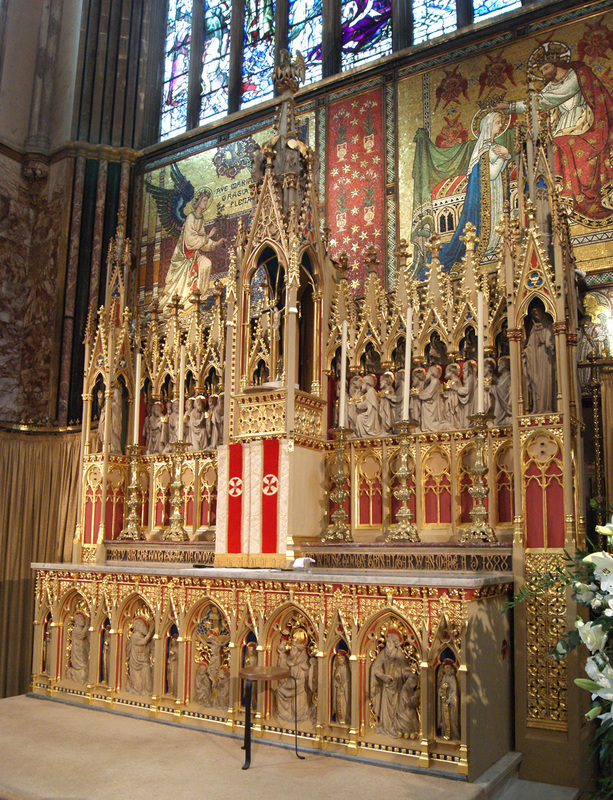 The reredos contains figures of the twenty-four Elders mentioned in the Apocalypse.” Originally the stone was gilt and polychrome in tones of red, green and blue. 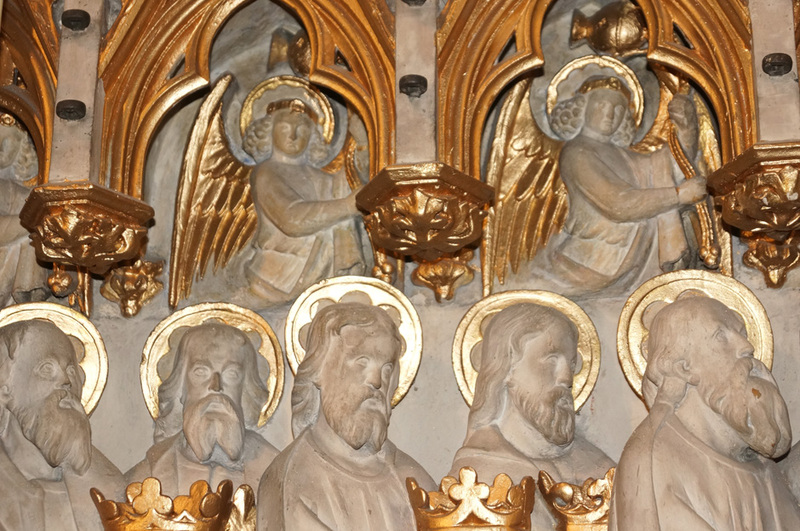 All of the colouring was painted over with lead white and the gold had a thick layer of bronze paint applied over it. 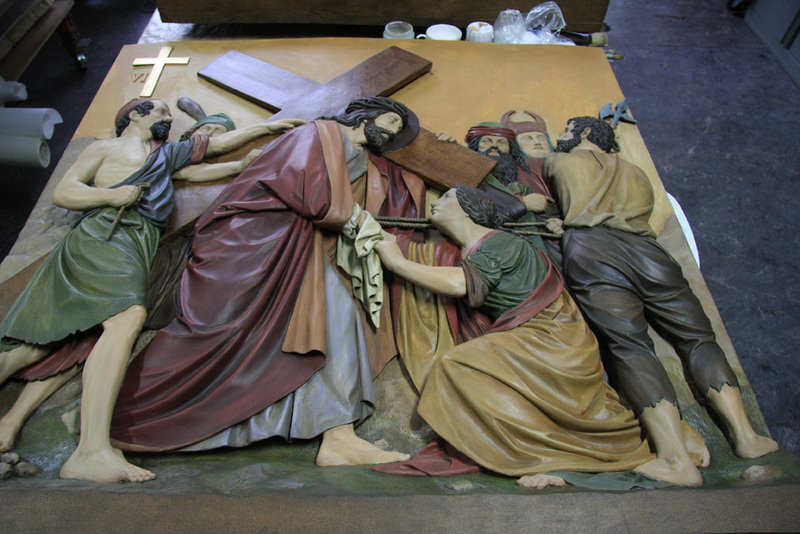 It was damaging to attempt removing the lead white and bronze paints and therefore, as with the stations of the cross, it was decided to re-instate the original polychromy and gold finishes after careful investigation of the paint surface.